If all deliveries to all shops stopped today, would you be able to survive? Is your pantry stocked with ingredients that you can use to prepare a variety of dishes? Is your freezer packed with meat, seafood, poultry, fruit and vegetables? Do you have a stockpile of toiletries and cleaning supplies? What would you do? Imagine there is a national transport strike. How would you survive? Do you have food to last a day? Two or three days? A week? Could you go longer without having to find food? What about medicines? Baby needs? I ask because today is the the date set for the start of a general strike by truck drivers in the USA, where no freight will be transported by road for at least three days, perhaps up to seven days. That means no deliveries to supermarkets. No deliveries to butchers or markets. No milk deliveries. No pharmaceutical deliveries. No fuel deliveries. Nothing. I imagine supermarket shelves will empty in minutes because most households don't run an active, working pantry. Many homes wouldn't have enough food to last more than one or two days. Some may be able to stretch to three or four days, but a week would find the food situation dire. So imagine that could happen here. Imagine if just 25% of truck drivers chose to stop delivering. 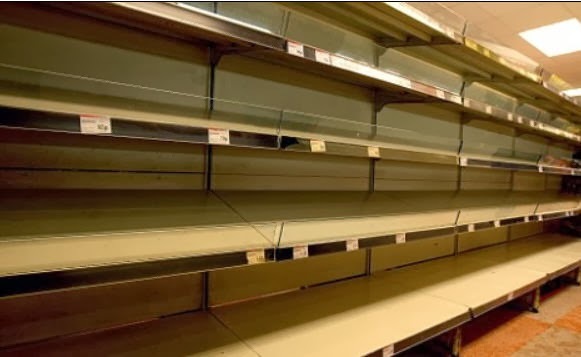 Localized shortages would happen almost immediately as people panic buy bread and milk, meat and vegetables. It wouldn't just be supermarket shelves that emptied either. It would be chemists, hardware stores, newsagents, department stores and the corner milk bar. With a fully stocked pantry you'd be just fine. While everyone else is pushing and shoving and queuing to buy bread and milk you would be safely and happily at home, preparing dinner from your pantry. Would you be OK? Would you be able to maintain your standard of living? Or would you be one of the masses, panic buying staples, hoping they'll last to get you through? This is just one scenario that could affect your food security. Cheapskater Amanda and her family are regularly cut off from their nearest town for up to a week (sometimes it's been longer) by flood water (they live in rural Queensland). Without a stocked pantry they'd be in trouble. Amanda keeps a pantry stocked with ingredients so she can use to cook a variety of meals and foods from scratch, rather than having it stocked with ready-made foods that are good for one purpose only. Even a week of being in bed with the flu could cause difficulties in many homes because there isn't a stocked pantry. There are dozens of reasons for maintaining a stockpile. My stockpile is three months worth of basic pantry items: flours, sugars, dried fruits, cereals, spices, pasta, toiletries, cleaning supplies, jams, tea and coffee, milk powder, sauces, meat, poultry, fish and preserved fruits and vegetables. I'm not suggesting for one minute that you rush out and spend a fortune stocking up on groceries. But having a small stockpile of basic groceries is a good idea. Build your stockpile based on what you use regularly. There's no point having a dozen cans of tuna in the cupboard if you don't like it or use it. On the other hand a dozen cans of baked beans will get used if you love them and use them in lots of recipes (baked beans are a wonderful way to stretch mince-based meals). Think about what you use, how you use it and then as you do your shopping put one or two stockpile items in the trolley. Use your grocery slush fund to pay for them or better still, leave one or two things you don't really need (soft drink, biscuits, chips, dips, flavoured milk, sugary cereals etc.) on the shelf and replace them with your stockpile items. By the way, all those things you can leave on the shelf you can easily MOO, and they'll be cheaper and healthier than anything you'll buy at the supermarket. Do you have a stockpile? How did you build it? Where do you store it? How long can you live from it? Would a transport strike cause you to panic? Or would you not even notice it because you have a good stockpile? Please share your stories in the Comments below. Yes I have a stockpile. My family of four could easily last 3 - 4 months. We'd have to ration some things but we'd survive. We also have chooks and a veg garden that would help us. I keep my stockpile in the pantry and freezer. Everything is well stacked and labelled. No space is wasted. I have a fridge freezer in my kitchen that holds what we r using that week and another pantry in my kitchen for sauces, spreads, herbs, baking goods, cereals, pastas, rice things that r open and used on a daily basis. i also have a store space for root vegetables in my kitchen. In our back yard we have a vege garden, not much in there at the moment but enough to get by, and my husband has just built me a larger herb garden to plant all my herbs that i use regularly. Not sure how long we would last on what I keep in our stores but for a little while at least!